When blues are actively feeding they’ll eagerly hit almost any lure. They especially like lures with a lot of flash. In 1993 a woman who was swimming at a New Jersey Beach had both her ears bitten off when a bluefish attacked her silver ear rings. Once hooked, they’re known for strong runs and acrobatic leaps that can make landing them on light tackle very entertaining. Since they’re almost impossible to avoid during the Chesapeake summers, I occasionally make trips specifically to target them. I was joined this weekend by my sons Daniel, Cory, and Jacob. 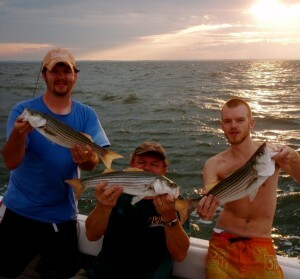 We fished both days of the weekend targeting blues on Saturday and rockfish on Sunday. Our timing Saturday wasn’t the best because we only had the mid-afternoon hours to fish. Fortunately, we found breaking fish on the east side of the Bay not too far south of Kent Island. We used one ounce metal jigs with 30 pound leader. Conventional soft plastic baits are useless for blues because they’ll bite them right into. We easily landed fifty bluefish, maybe more in the 4 hours we had on the water. We kept a dozen or so for smoking. 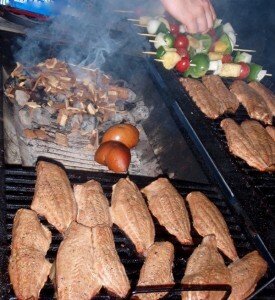 Smoked bluefish are one of the Bay’s summer delicacies. When prepared correctly, they’re unbelievably good to eat. Sunday we changed from metal to new-generation plastics and jigged beneath or down-current from the breakers for rockfish in the 20 inch class. The wind was really blowing, but the fish were biting and we had a very successful evening. *This recipe employs a “hot smoke” technique, which calls for a higher temperature (about 250F). “Cold smoking” would be better for a large side of bluefish (similar to a smoked side of salmon), but the smaller bluefish do fine when cured for a short time using higher heat. – Fillet blues, leaving the skins on. No need to scale them. Rinse fillets with cold water and pat dry. – Coat the fish well with kosher salt. Place on racks over drip pans to catch excess moisture. Cover loosely with plastic wrap and refrigerate at least one hour, overnight is better. 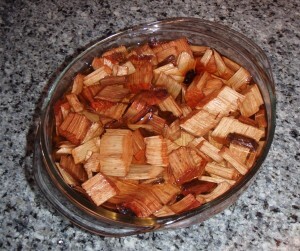 – Soak hickory or fruitwood chips in water. We use about 8 cups of chips. You can soak them for as little as 30 min prior to smoking, but longer is better. To add more flavor, use beer, white wine, or apple juice with some cider vinegar. – Preheat your cooker. You can use a regular grill. It doesn’t have to be a smoker. For charcoal grills/smokers I prefer chimney starters loaded with all-wood charcoal. Don’t use the MatchLight stuff unless you like the taste of lighter fluid with your fish. For gas grills remove one grill grate and preheat the burner beneath to low (best on grills w/ at least 3 burners). – Rinse fish to remove salt coating. Season to taste. A simple kosher salt/cracked pepper rub is enough and probably all you need. Old Bay or any combination of spices is also good. We sometimes add a little maple syrup as well but remember the smoke will provide most of the flavor. – Charcoal grills: Once coals in chimney are glowing orange with a gray coating, dump them and rake them off to the far side of the grill. Place half of the drained wood chips (4 cups) directly on the coals. Gas grills: once your grill reads between 200 to 250F, place half of the chips (4 cups) on a square of aluminum foil. Fold the foil around the chips to make a pouch. You can also use a disposable aluminum pan. Cover and poke a few holes in the top. Place the pouch directly on the preheated burner. – Place the fish on the opposite side of the grill, as far from the heat as possible (I like to use the warming rack suspended in the lid of most grills). 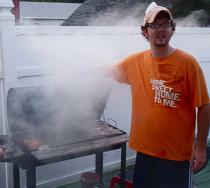 Be sure the fillets have room between them for the smoke to circulate. Close the lid and be sure any vents in the grill are closed. You can also add fruit peels, apples, etc. to the chips to add flavor. (Gas grillers, now’s a good time to prep a second pouch for the remaining wood chips). – After one hour, add the unused chips. You shouldn’t need more charcoal, just stir it around and pile it back up. For gas grills, just take out the old smoke pouch and stick in the new one, close the lid, and don’t open it again for at least another hour and a half. You’ll already have “cooked” bluefish at this point which will be tasty, but be patient. It gets much better. There is an “oh-my-god” factor that kicks in as the meat continues to cure. 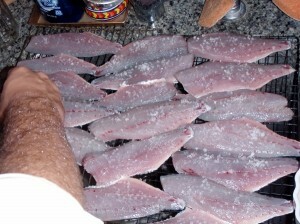 – The fish will finish curing in around 4-5 hours. They’re done smoking when the fish have a carmel-brown patina, and the ends are slightly shriveled. The meat should have a consistency somewhere between beef jerky and smoked salmon, with a deep smoky flavor. The meat is fantastic alone, but Dianne stirs it into cream cheese with some chopped scallions to make a dip/spread. Spread it on bagels in the morning, bread at lunch, crackers for hors d’oeuvres or just shovel it into your mouth with your fingers. And speaking of “smoking blues,” here’s a photo of Daniel last weekend on-stage with the Lovell Sisters, one of the “hottest” bands in bluegrass music. This has to be my favorite report on the new site. The picture of Jake on the bow of Crockett’s Reel is unbelievable. It looks like you are in the ocean. 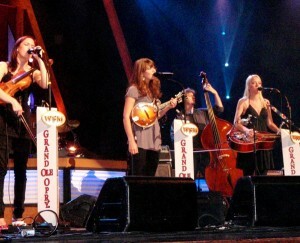 The last shot with Daniel and the Lovell Sisters at the Grand Ole Opry is great. I’d be more than happy to take them out on the bay anytime. Please arrange that for me. Shawn: Do I detect a slight HINT OF PRIDE??? You have every right to be proud. This Sat., I am heading to O.C. for 6 weeks of piscatorial pursuit. I will be joined by my Daughter, Son in law and Grandson and his friend this Sunday for a week. Looking forward to some quality time with them. My Other grandson and his wife will join us for the next two weekends. My son and his wife will join us just after Labor Day. 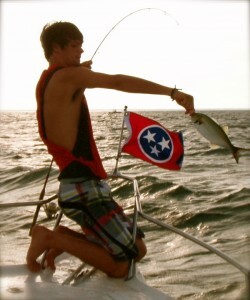 Fishing will be the official language spoken. Great report. I can’t wait to try the smoking recipe. I’ve always heard about it but never had it. That asian devil pepper recipe sounds delicous! Shawn: Excellent report. I’m glad the blue fish showed up early and if we’re lucky they will get up in the 5 to 7 pound class as they did 3 years ago. I hope to get out this afternoon and fish some pilings and drop offs close to Sandy Point. I’ll keep you posted if something happens. Opps! I just checked the date….it was a good read, but I made a mistake on what happened yesterday, 5/11/2011. I won’t let it happen again.